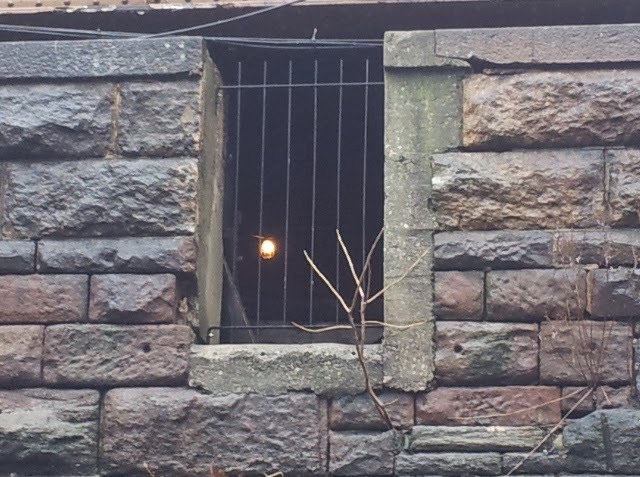 NEW YORK TOURS BY GARY : What is this, looks like a wine cellar. It is not. What is this, looks like a wine cellar. It is not. Is it a medieval prison or a wine cellar under some villa in Tuscany? The brick work is very middle 19th century so we can rule out anything medieval. Well I will tell you that it is here, it is on Park Avenue as a matter of fact and it ain't no wine cellar. In 1831 a company called the New York & Harlem River Railroad began running streetcars hauled by horses up Fourth Avenue from Prince Street. Originally it went as far north as Union Square but eventually it was going to go further. The population of this fair city was growing and that population had only one way to move and that was up this long thin island. Horse cars was one way to move people; however, as you can imagine the process of getting uptown was long and you only moved as fast as the beast of burden did. Sometimes the beasts did not come back downtown . 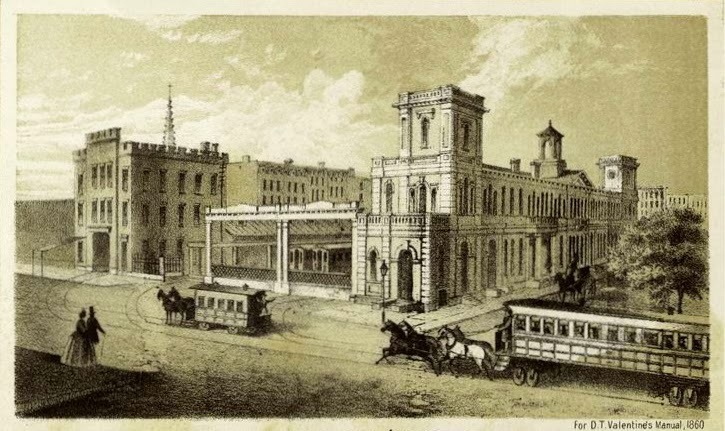 . .
By 1832 the New York & Harlem River Railroad had moved all the way up to 23rd Street and Fourth Avenue and by 1836 to this larger castle-like facility between Madison and Fourth Avenues bounded by 26th and 27th streets. By this point the NY&HRR is running steam engines, however, in 1858 a ban will be put into place as to how far south a steam engine can go. The risk of an exploding steam engine, as these things had the unfortunate propensity of every now and then doing that, was to great to bring into a populated area. The limit will be set at the once upon a time wilderness of 42nd street. This print is from the Valentine's Manual and is dated 1860. On the lower right, that is a train car being pulled by a team of 4 horses, the horses are pulling more than just this one car. The engine was removed at a facility at 42nd Street and 4th Avenue. In the center of the print, the smaller conveyance is a horse car and the building eventually became P.T. Barnum's Greco Roman Arena and then Frank Gilmore's Garden Arena. This is the great grand father of the current Madison Square Garden. This is the what is known today as the Park Avenue Tunnel. It is now a one way car tunnel starting at 33rd Street and feeding into the Park Avenue viaduct around Grand Central Terminal. It did not however start as a tunnel, it started as an open cut beginning at 33rd Street. Remember that this was a horse drawn world and I do not know how plentiful horses were but this island I call home was once a great deal hillier, so New Yorkers have been trying to flatten this rock for centuries. This open cut went through a hill named for the local once upon a time land owner, the Murray family. The horses pulling the horse cars could not get over the hill without seriously shortening their service life. Eventually steam engines are plying the open cut. The City of New York had required the addition of bridges at the cross streets and soon after the steam engine ban went into effect, the open cut was covered and turned into a tunnel. Plantings were placed on the tunnel roof and thus the name Park Avenue is applied to 4th Avenue north of 33rd Street. South of 33rd is Park Avenue South. 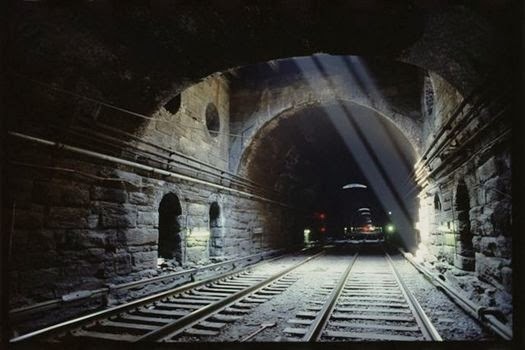 This is a picture of the tunnel with street car tracks and a station within the tunnel. By 1871, Cornelius Vanderbilt, who had become incredibly wealthy in shipping and by starting what would eventually grow into the Staten Island Ferry, had put together his uber-railroad, when he became majority stock holder in various smaller roads. Amongst them was the Hudson River Railroad, The New York & Harlem River Railroad and a small upstate line with the name New York Central. He believed that people needing to travel by rail would come up to the wilds of 42nd Street; his peers tried to talk him out of it but he knew that the city would grow, could only grow, up the island and with a build and they will come attitude gave us the first, and immediately inadequate, of 3 Grand Centrals. This put an end to the horse drawn train cars under Park Avenue. 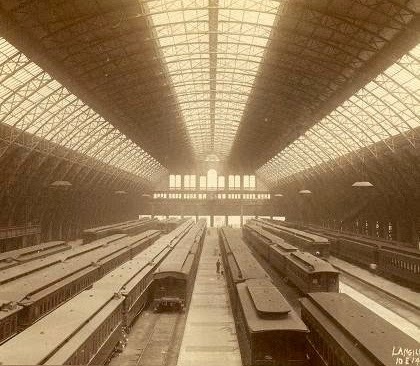 This was the glass and steel train shed on the north side of the station. Impressive, is it not. 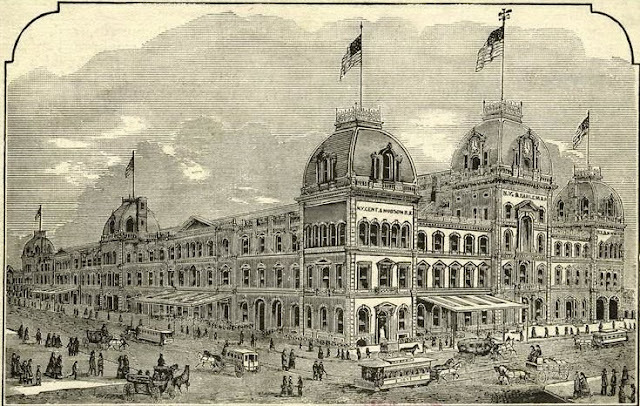 It had been influenced by the old Crystal Palace located where Bryant Park is now, and this influenced McKim, Mead & White in their design of the late great Pennsylvania Station. 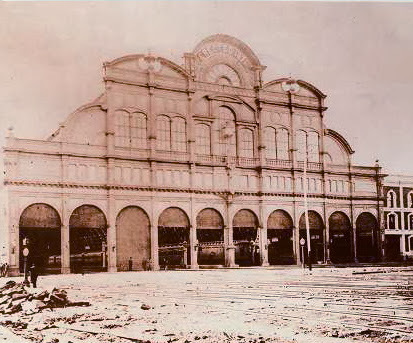 This is the north facade of the train shed and that is Park Avenue, with tracks and dirt all over it. 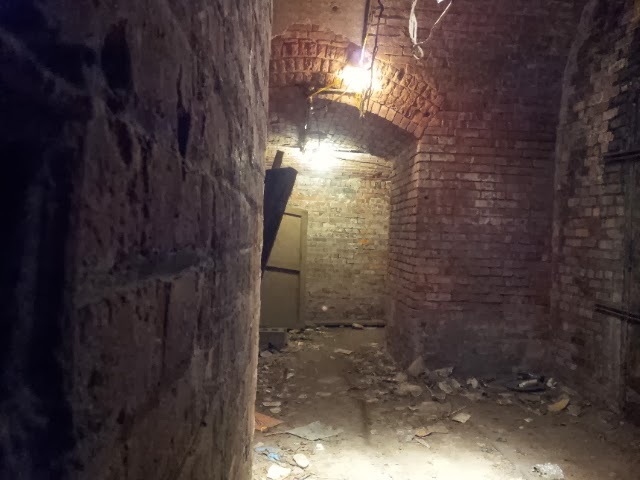 This is the tunnel under Park Avenue. 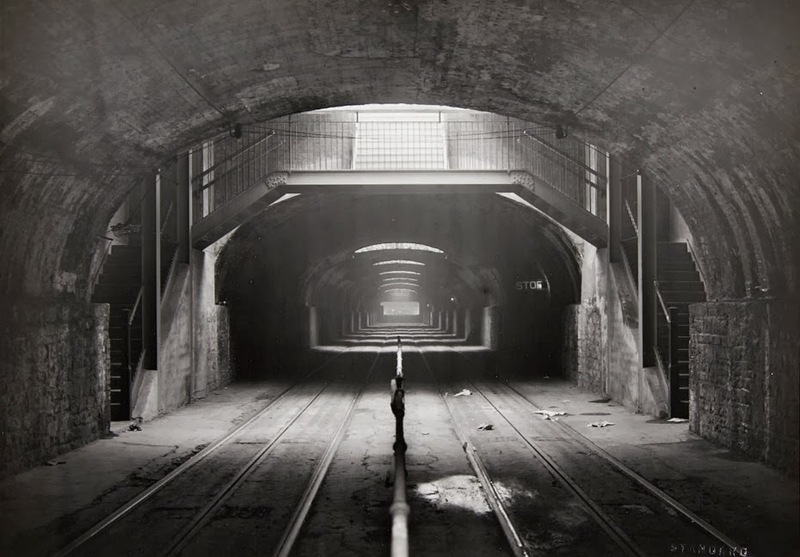 The tunnel existed as far back as the mid 1870's but it went only as far south as 59th. Notice the over-abundance of ventilation holes as this was built for steam - don't let the 3rd rail fool you. The tunnel was also built with stations for passengers at 59th, 72nd and 86th Streets. The horse cars were a slight improvement over walking but the trains were a huge improvement over the horse cars. Neighborhoods will blossom as the stations will spark development. 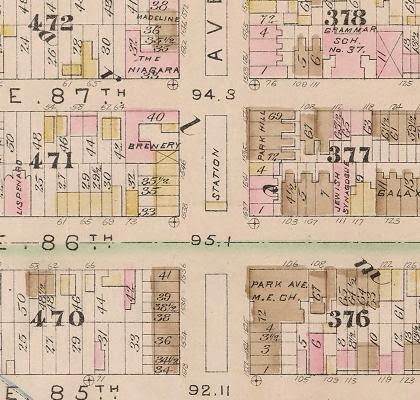 86th Street was on the grid prior to the grid map being published. It was a road to the Hells Gate Ferry and still was when this map was printed in 1885. The 86th Street station was accessed by a little structure in the center island, now marked by 2 steel emergency exit doors. There were 2 more stations north of this. The obvious one is 125th Street. The other one is not as obvious. 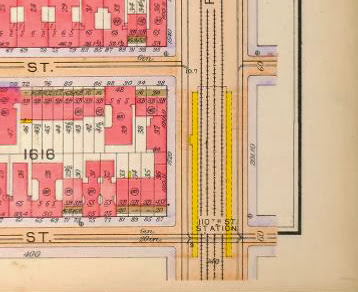 Again a detail from the 1885 map and this is the station at Park Avenue and 110th Street. The platforms were up on the viaduct, as the tracks come out of the tunnel at 97th Street at what was once called Mount Prospect (I guess that the Harlem Plains would be the "prospect"). This means that the station facility was within the viaduct. These are 2 views from inside the pedestrain arch on the north side of 110th Street. The door is a gate with rusted metal panels large enough to stuck my hand through. This was the main entrance to the station. 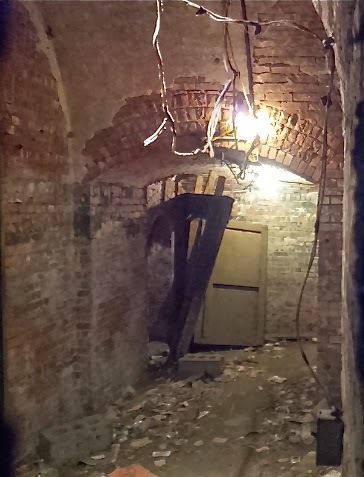 There are stairs, probably on both sides, at the end of this corridor. 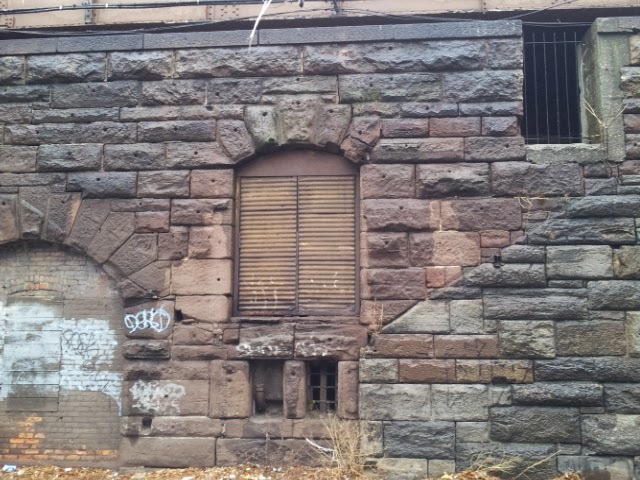 This is the eastern side of the viaduct. The arch on the left is at street level but I am not sure it was a pedestrian entrance, maybe a carriage entrance but I am not sure. The scars of were the stairs would have been are plainly visible. 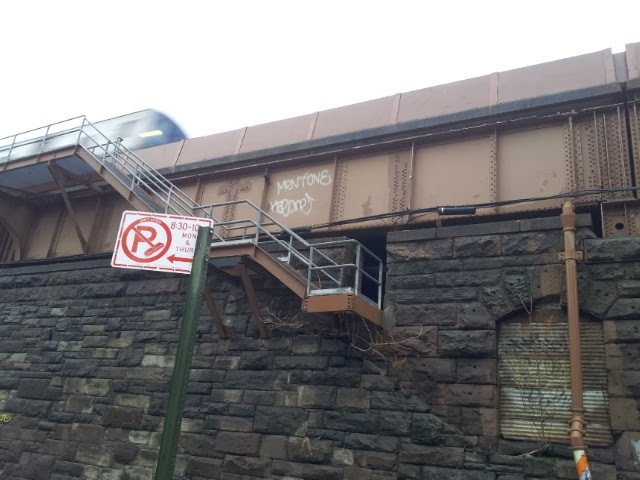 Did a passenger go back inside or were the tracks raised after the closing of the station? The tracks were raised so it is possible that were the gate is would have been a small staircase up to platform level. But what is there now? There are scars of something above this arch. This is where the stairs come out of. Perhaps a cast iron and glass canopy? 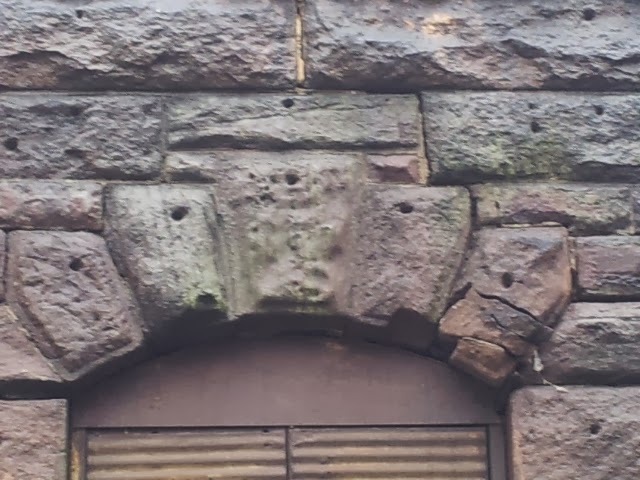 In the keystone above the arch, does that not look like a weather beaten . . . something? A corporate logo perhaps? I stuck my camera into the little window under the arch in above picture. 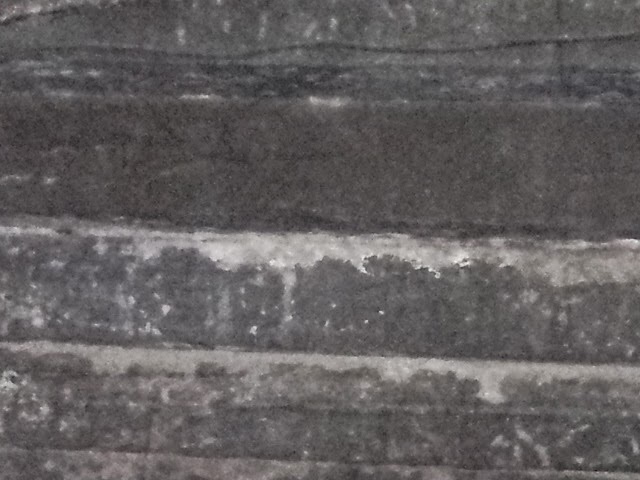 It was pitch black but this is a back of a staircase. There is a light at the top of the stairs. This is again the eastern side and the holes on either side as well as the concrete patch work indicate that there was once something there. This is the western side that does contain a maintenance / emergency entrance / exit staircase. Dramatic with the train, right? This is the map from 1916. The station is there but not for very much longer. It appears that the need for these stations will not be needed. 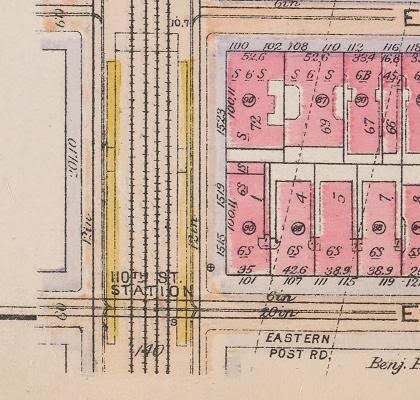 There already had been the 3rd and 2nd Avenues where in place by the early 1880's and we will have the Lexington Avenue subway running by 1918 so the East Side was well served and the New York Central did not need all of those stops, even if they would have been incredibly convenient.